David Lebovitz usually has ice cream recipes involving quite a bit of egg yolks. When I came across this recipe of his, I was thrilled that there was no egg yolks involved. Being so, this recipe was super easy to make with a small handful of ingredients. Simply combine half & half, cocoa powder, sugar and salt in a saucepan until it starts to boil and foam... then whisk in peanut butter. Chill the mixture and then churn away. 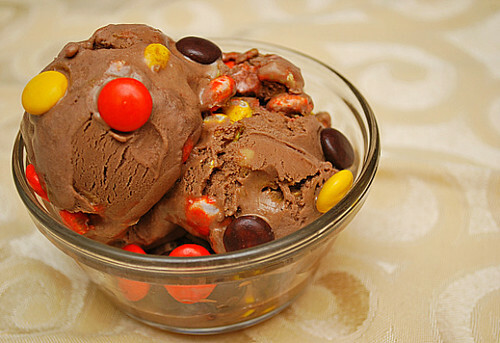 To put the ice cream over the top, I mixed in Reese's Pieces candies after the ice cream churned. It added an extra burst of peanut butter and a nice touch of color too! In a large pan, whisk to combine the half and half, cocoa powder, sugar and salt. Heat the mixture, whisking frequently, until it comes to a full, rolling boil and begins to foam up. Remove the pan from the heat and add the peanut butter, whisking to blend thoroughly. Refrigerate the mixture to chill thoroughly, then freeze it in your ice cream maker according to the manufacturer’s instructions. After churning, fold in the candies into the ice cream and transfer mixture into a freezer safe container. Freeze overnight to ripen before serving. You may think I'm weird, too! I don't like any nuts or nut-related products (like peanut butter). The only exception I make is Nutella because it tastes like chocolate! I don't like nuts either, but I can take peanut butter from time to time. The yolks aren't necessary in this recipe because of the peanut butter's semi-solid viscosity. Your ice cream looks absolutely amazing. Chocolate and peanut butter together is a delicious combination!! !